So I ordered 3 different boxes to break and review and to be completely honest with everyone, the 98 Gold Label retail, and 98 Upper Deck retro weren’t anything to write home about. If you would still like a review of either or both, please leave a comment for me down below. I’m super excited to have a lunchbox to take with me to my Elementary classroom with Griffey Jr. on it though 🙂 Now on the break that impressed me the most! I do want to mention that a scanner will be in hand within a day or two, so please bare with the iPhone pictures for now. 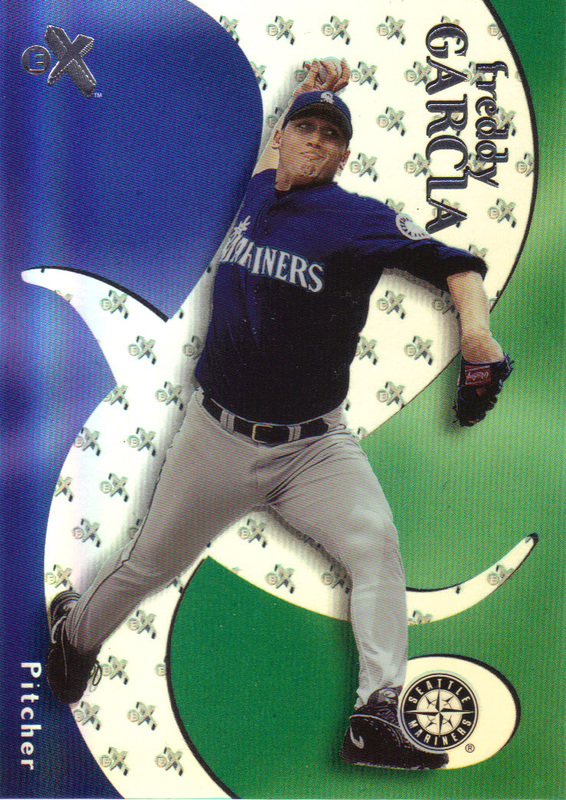 Pacific is famous for their inserts and numbered parallels, which I also enjoy finding in packs from the 90’s. This box didn’t disappoint in low odd inserts and surprises! The base set consists of 250 players and you get at the least 4 of them out of the 6 cards per pack. I have close to the base set, however two of the players I always want to see come out of breaks (Alex Rodriguez & Ken Griffey Jr.) didn’t show up in this one! The cards themselves have a very simplistic look to them but any foil lovers with like the gold foil names. The color of the foil also eludes to the base or parallel set it belongs to. I received 36 of these as expected. Nothing too different here other than the lettering. Now this parallel set really stands out with the silver foil and gold Holo Silver stamped. Andy Benes came from this box. If I ever see an Alex Rodriguez like this I will surely jump at the chance to pick it up! If you haven’t picked up on the common theme of foil being the catch to this set then you can probably guess what’s coming on this next insert. There’s a nice combination of foil and a vanilla background to make these inserts stand out. I was pleasantly surprised to see Derek Jeter! I tried touching this one up to make that foil pop and I think it turned out nicely. I’m a really big fan of these inserts. Pacific made them for 3 years (1998-2000) and they are each similar in the design. Another popular look with Pacific’s inserts is the laser-cut technology. 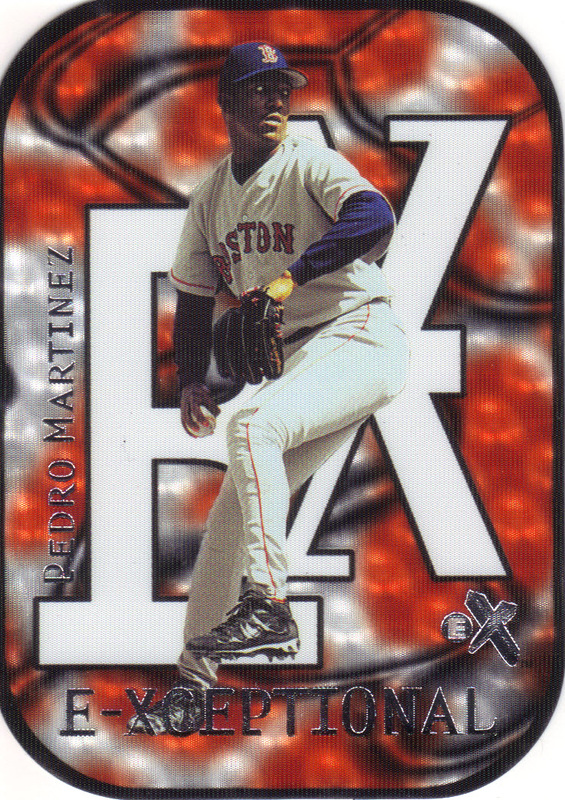 While they weren’t the most sought after brand, they do boast some of the most uniquely designed inserts on the 90’s insert market. Stay tuned for some examples coming up later this week 🙂 We were lucky enough to find one of these in this box of Mark McGwire, my dad’s favorite player growing up. Although this last parallel is guaranteed at one per box, I couldn’t have been happier with the player one the front of the card. This came within the first few packs so the rest of the break was a cherry on the sundae for sure! There’s quite a few Thomas collectors out there so hopefully this will be able to add to their collection! These are blue foil variations of the base cards. Was hoping to catch a glimpse of one but perhaps one will show up in a second box someday. These inserts look like this Ripken here. Typically when you think of an insert coming in at these odds, you are looking for something that stands out a bit more. I don’t have a Rodriguez like this coming yet, but I will once I get around to placing an order of strictly Pacific inserts of his. If it’s worth it I’ll post a follow up. There are no pictures of these on eBay I could find. Imagine what finding one of these would feel like. I only received a few duplicates which took the place of Griffey and Alex Rodriguez lol. Other than that I’m only 20 cards or less from the base set. All the corners were sharp and the glossy finish of the cards is like they were the day they were packaged. A Jeter insert of any kind is fantastic! That, coupled with a Thomas that is very desirable among 90’s collectors, and the die-cut make the pulls the best to date since I’ve broken 90’s boxes. For a $29 box I’d say that we did pretty darn good here! However, I’m pretty sure that this box could have had little to no value in it had that parallel not been of a highly desired player. Let’s say it was Royce Clayton (sorry Royce), then there would have been 3 boxes of base + a few low end inserts from today. If you like chasing parallels and want to put a base set together with a box or two, then this cheaper Pacific product is for you. Just don’t expect much going in and you’ll enjoy the break like I did. I have a total of five boxes that have been busted and are awaiting review (yes, there will be more hockey!) so I thought I’d start things off with an old favorite of mine, 2000 E-X baseball. I broke a box of this product when this blog was brand new. In fact, this post comes nearly two years to the day that I broke that last box! Here’s a quick recap of box number two. 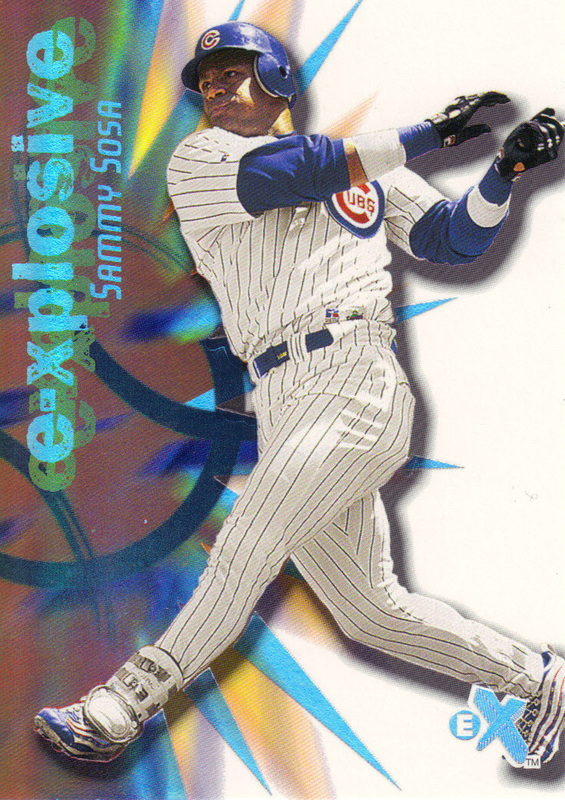 Base set: Each base card has a unique color theme, based on the team of the player depicted. Altogether, there are 60 short set base cards (I pulled 56/60, 93%), followed by 30 shortprinted prospect cards which are numbered to 3499…. …..and they look something like this. I pulled two prospects: Wily Mo Pena (1522/3499) and Cesar King (1302/3499). I love the creativity of this insert. The player….not so much. These cards are available in Red (/1999), Green (/999), and Blue (/250) variations. I love these cards. Some day I’ll make a master set of them….maybe. Here’s a solid piece of Phillies tradebait. Anyone interested? The collation was about what I expected. I received one more duplicate from this box than I had the last one. I’m used to far worse. The base cards are very subject to peeling. In some cases, it may just be a corner. In others, much worse. I didn’t experience too much of this in the last box I opened, but I wasn’t as lucky this time. Keep this fact in mind when deciding whether or not to try a box. (For the record, the inserts were flawless). Nothing to complain about here. I was especially happy that my autograph was of an established veteran and not someone with 5 career games. I was happy to find this box for around the $30 mark, about $20 less than the typical asking price. For that price, I’d still recommend the box regardless of what I said about potential condition issues. The cards are brilliant overall and if you pull any damaged base cards, just let me know and I can replace them for you as I have nearly 3 sets worth of this stuff! 1. Chirography: Everyone’s probably familiar with this set. It’s been the staple set for SP Authentic autographs since day one. McGwire signed 50 cards for this set. 2. Chirography Gold. This parallel mirrors all but two cards from the Chirography set. 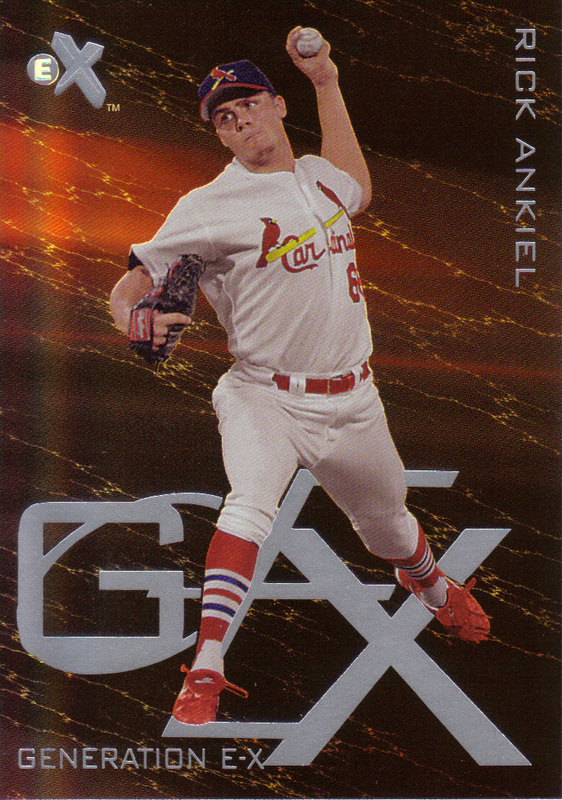 The print run for each card was based off the player’s uniform number. In McGwire’s case, it would be 25. 3. Signed Big Mac. This 10-card set featured various photos of McGwire, though only one of these cards featured him as a member of the Athletics. Speaking of various, the print runs on these cards range anywhere between 1 and 70, with six of them being numbered to 7 or lower. 4. Big Mac Missing Link. Remember what UD did with 2008 Upper Deck and the “retro” jersey cards with the designs of 1997, 1999, and 2000 Upper Deck? (NOTE: They call the 1999 and 2000 designs 1998 and 1999 respectively, guess they didn’t want to use the real 1998 Upper Deck A Piece of the Action design). 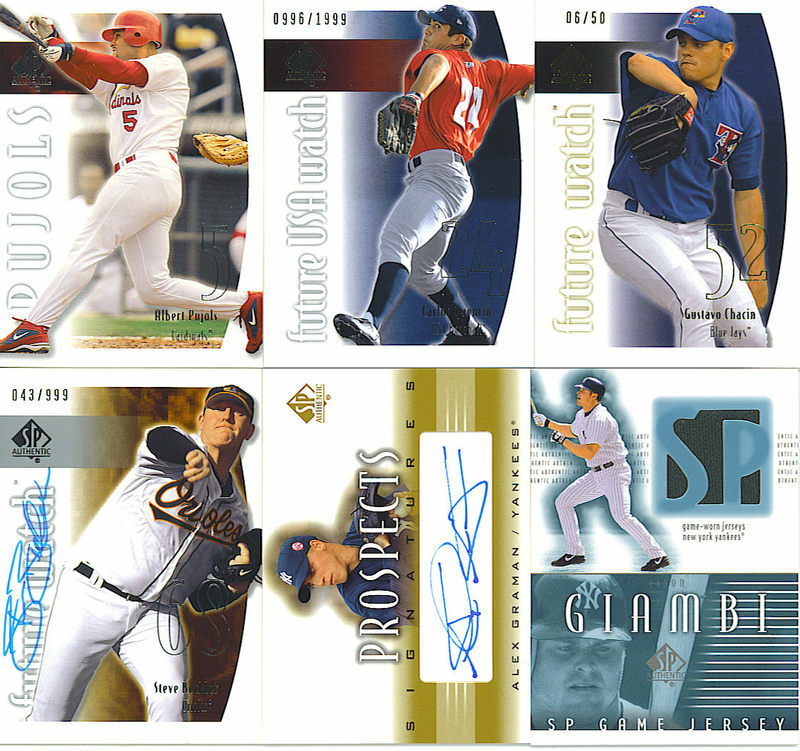 Well, in this set, McGwire signed five different cards, each of which mimicked a past Chirography design from 1998-2002 (yes, even 2002!). Each card was numbered to 25. 5. Authentic Excellence. Alright so this wasn’t technically a set, but rather a single card. But what a single card it was! 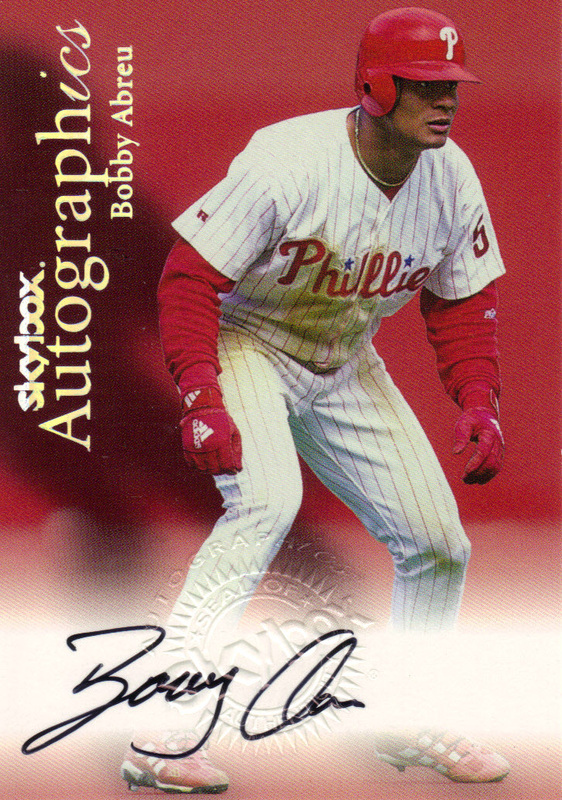 This card featured several UD spokespeople and featued signatures of Mark McGwire, Sammy Sosa, Ichiro, Cal Ripken, Jr., Ken Griffey, Jr., and Jason Giambi (hey, he was hot stuff back then!). This card was presented as a fold-out. Take that Triple Threads! 6. Signs of Greatness. Finally, the last set is once again a single card. You may recall hearing about it in the past. It’s the 6-player autographed card of Babe Ruth, Mickey Mantle, Joe DiMaggio, Ken Griffey, Jr., Mark McGwire, and Sammy Sosa. Naturally, this card was a 1/1. I wonder where that card is now. Base cards: In typical Authentic-like fashion, there is a short set which is followed by a ton of subsets. In this product, cards 1-90 make up the short set. I fell just ONE card short of completing the short set while receiving 21 duplicates. The one card I need is number 77 if anyone out there has it. Future Watch (numbered to 1,999): Cards 91-135 make up the Future Watch subset. I pulled two of these: Kevin Gryboski (Braves) and Brian Mallette (Brewers). One for dayf and one for Thorzul, no? Autographed Future Watch (numbered to 999): Cards 136-170 are autographed “Future Watch” cards. Most of them are numbered to 999, but there a few select shortprints which are limited to 249 (Kazuhisa Ishii for example). Overall, these autographed cards fall one per box on average. I pulled a card of the late Steve Bechler. Bechler died in 2003 of multi-organ failure which was preceded by heat stroke. It was discovered that the drug Ephedra played a significant part in his death. He was just 23. Future Watch USA (numbered to 1,999): The final “Future Watch” set is a standalone insert set with 22 cards. They are also numbered to 1,999 and once again, I pulled two from this box. The first was Grant Johnson, who was drafted by the Cubs in 2004. The second was Carlos Quentin, who was having a breakthrough year before suffering a wrist injury the day before I pulled this card! Other players in this set include Rickie Weeks, Dustin Pedroia, Conor Jackson, Huston Street, and Chad Cordero. Limited Gold (numbered to 50): There are two parallels in this product that mirror the entire set (subsets, autographs, and all). The first is the Limited parallel which is characterized by a blue-foil over the card’s font. These cards are numbered to 125. The second parallel is a little rarer and is entitled Limited Gold. These cards can be distinguished by a golden foil over the font and are numbered to just 50. I pulled a “Limited Gold Future Watch” of Gustavo Chacin. Prospects Signatures (1:36 packs): If the signed “Future Watch” cards weren’t enough, there’s a 12-card prospect signature set. They fall 1 in every 36 packs on average and have a rather lackluster checklist. Aside from Bill Hall and Xavier Nady, nobody really stands out. I pulled an Alex Graman, who has a career ERA of 18.47 in five appearances (two starts) over parts of two seasons with the Yankees. He currently plays in Japan with the Saitama Seibu Lions, where he is teammates with Kaz Ishii. Game Jersey (1:24 packs): My final “hit” was a game-used jersey card of Jason Giambi. I’m not a fan of the design of this card at all. I’m not really a fan of full-body shots of the players scrunched up into a corner of the card, among everything else that looks ridiculous on this card. 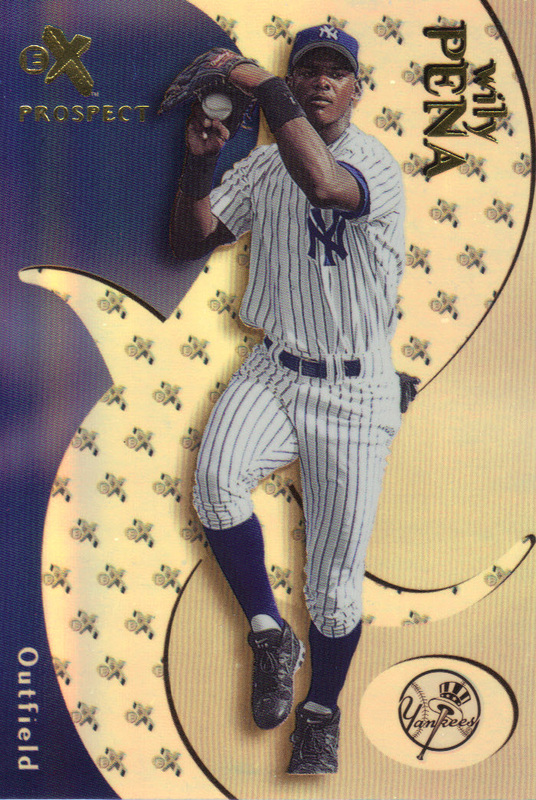 There is Gold parallel to this set in which print runs are based on the player’s jersey number. Final Thoughts: I’ve always been a fan of SP Authentic. Well, I was before they introduced (what I believe is) one of the stupidest concepts ever, Lettermen. The 2002 edition was a very solid product. The base set was nice. “Hits” were guaranteed. Aside from the Prospect Signatures set, the autographs are attractive and hard signed. The autograph checklist is very strong and includes: Mark McGwire, Ichiro, Barry Bonds, Alex Rodriguez, Ken Griffey, Jr., Sammy Sosa, Tom Glavine, and Tony Gwynn among others. 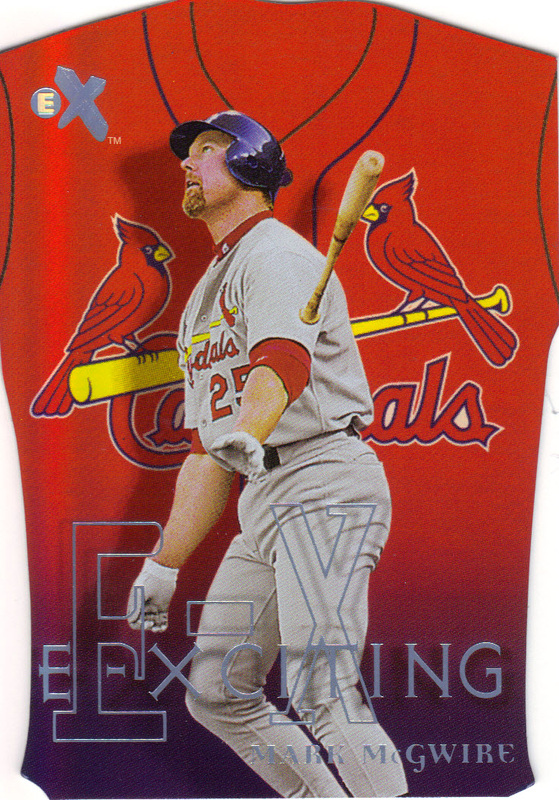 And don’t forget about all those McGwire-themed sets I mentioned above! This box in particular wasn’t the strongest, but wasn’t too bad considering I didn’t pull a Chirography card. I don’t think I’ll be purchasing another box soon, but I would recommend giving it a shot.